Hi! 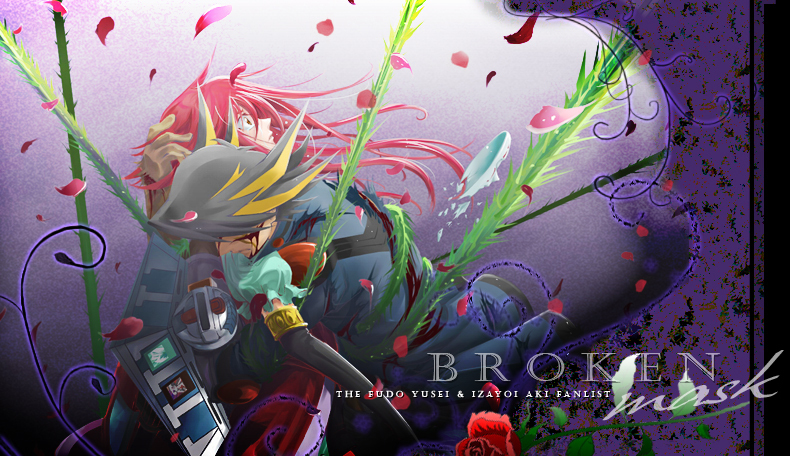 Welcome to BROKEN MASK, a shrine and the official TAFL approved fanlisting dedicated to Fudo Yusei and Izayoi Aki, two marvelous characters from the series Yu-Gi-Oh! 5D's! Aki is an hartless and mysterious duelist that hides her identity behind the code name Black Rose Witch, Yusei is a cool and rational boy with a golden heart. Their meeting changes Aki's life and her conception of duels. Yusei can see in her heart. She isn't a witch, just a fragile girl that needs to be accepted. Aki doesn't know what a friend is and she can't believe in anyone but herserlf. A big and very special thanks to the great Towa for the beautiful fan-art. It's the expression of their feelings and I hope that one day, Yusei will drain Aki's tears erasing her sadness. Please, choose a link from the left to fully access the site and if you're Aki & Yusei's fan, feel free to join their fandom! Update of June 6, 2009: 25 members, thanks to all! Update of February 13, 2009: Carly added as affiliate. Update of February 7, 2009: Luna-chan added as affiliate. Update of February 6, 2009: new codes added. YU-GI-OH! 5D'S is property of Takahashi Kazuki, all rights reserved. This is a fan- site, I don't intend violate them. Layout and contents are @Dorothy. Do not reproduce without permission.